Celtic carried a five-goal advantage into the second leg following a comprehensive win over Astana in Glasgow. This tie was now a formality. The Scottish champions had one foot in the group stage. It was an unusual position for Celtic to be in. Yes, it was a commanding lead. But they didn’t want to concede an early goal that would allow Astana a glimmer of hope. It was a good chance to see how Brendan Rogers would approach a very different challenge to the one his side routinely face domestically. Straight from kick-off we saw Celtic’s intentions. Rodgers clearly wanted to start in the same vein as the first leg at Celtic Park had finished. An early goal would of course be a bonus, but this was more about disrupting their hosts. The Hoops had been set up to deny Astana the opportunity to settle into an early rhythm. With five goals needed just to stay alive in the tie, the hosts would have wanted to dictate play, launching wave after wave of attack in order to make inroads into the deficit. Celtic set up in a 4-2-4 formation as Astana kicked off. The back four will stay put, and you have the defensive midfield screen of Scott Brown and Olivier Ntcham (circled) for protection. That allows Scott Sinclair on the left, and James Forrest on the right to push up straight away. Centrally, Leigh Griffiths and Callum McGregor will converge to press the ball. As the play develops, the ball goes left, so Forrest, on the right, holds his midfield position. The Astana player in possession has two Celtic players in close proximity, and very little time to make a decision. 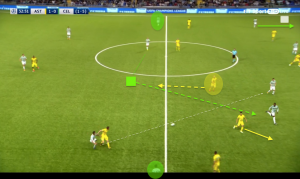 One passing option is blocked, while going back to his defensive colleague is dangerous as Griffiths is in position to quickly close him down (or indeed run into the space behind the defender, which he eventually does). He is forced into a first-time pass vertically through the two Celtic attackers. This is the trigger for Brown to join in the press. You can see him already sprinting towards the pass receiver. As Brown advances to the left-wing position putting pressure on the ball, Sinclair drops back, along with Ntcham and Forrest keeping a midfield three. Brown makes a successful block and the ball ricochets into the path of the onrushing Griffiths who is in behind the defence and able to get a shot off. It was a real statement of intent from Celtic, and led to their first shot on goal coming in just 11 seconds, and from Astana’s kick-off. As the match settled, Celtic enjoyed plenty of possession, but Astana were proving difficult to break down. We will see again later how left-back Kieran Tierney, in possession at the top of this picture, takes up positions in advance of the defensive midfielders. When he does, Mikael Lustig, the right full-back, drops back to leave three men at the back (out of shot here). Once again you have the two-man pivot of Brown and Ntcham in front of the defence. Scott Sinclair has moved to the inside left position in midfield with Griffiths the lone front man. This gives Celtic a 3-2-4-1 formation as they attempt to overload the midfield, while leaving the back three protected. Astana, in a 4-4-1-1, deployed a medium block to counter this. 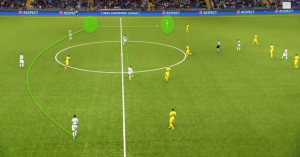 The secondary striker, at the bottom of this picture, filtered back to cover the space on Celtic’s right side as the midfield four stayed compact and narrow. Tierney, tight to the touchline, has nowhere to go. If he beats the first man he has the right back waiting, and also a covering midfielder on his way to provide a third obstacle. A pass to Sinclair, who is being man-marked anyway, is blocked so Tierney is forced to go back. 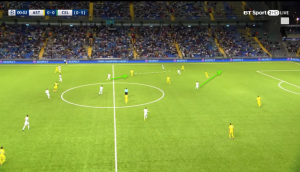 Celtic were patient in this approach however, happy to recycle possession and move from side to side, stretching the Astana midfield and probing to find gaps. Compare this picture to the last one. This came from a Celtic throw-in on the right-hand side. Lustig (closest) receives the ball from Forrest, and passes infield to Scott Brown. In the previous picture, Astana’s midfield four were compact and narrow, forcing Celtic back the way. Now, with a quick and simple switch of play by Celtic, Astana’s midfield line is fragmented. You can see the two pairs of midfielders, joined by the yellow lines, with a massive gap between them. Scott Sinclair (circled top) is peeling off to the touchline to create width. He, and McGregor (also circled) are already in dangerous positions between Astana lines. Tierney (green arrow) is about to break the midfield line and join them. Brown sprays the ball wide to Sinclair who can then run at defenders. It also highlights why Rodgers likes to have a right-footer on that left-hand side. As Sinclair cut inside onto his right foot this cleared out the space for Tierney to overlap and Sinclair is able to play the left-back into a dangerous crossing position. As a defensive unit, Celtic were generally going man-for-man. 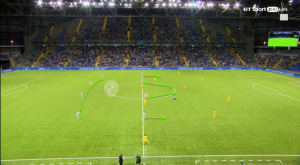 They were quite happy for Astana to have possession in front of them, restricting them to shots from distance whilst they waited for the opportunity to press and force turnovers. You can see this in the build-up to the Astana goal, pictured below. Celtic have everyone behind the ball, with yellow shirts all being picked up and Griffiths left to shuttle and close the ball down. The only mistake here was that James Forrest, whose yellow boot is just appearing on the left of the picture, is a little too central. That means he is late getting out to block the cross when the ball is played to Astana’s left flank. Still, no problem, as Celtic’s defence have all the Astana attackers marked in the middle. Forrest compounds his original mistake by switching off after the cross goes in though. Ajer manages to clear it, but it comes right back where it came from. Forrest is sleeping and doesn’t react, giving the Astana player all the time and space in the world to run onto the ball and take the shot that was deflected in for Astana’s first goal on the night. Forrest, circled, has his back to play, instead of staying with his man as the cross ball is cleared back out into a dangerous area. Again, though, Celtic wouldn’t have been overly concerned as they had previously allowed Astana several shots from this kind of distance. The resulting shot was going well wide, but the unfortunate Kristofer Ajer was a tad clumsy in sticking out a leg and diverting the ball past a helpless Craig Gordon. Celtic continued to be patient. The game plan was working, and but for that unlucky deflection, they were comfortable. Kieran Tierney, as everyone knows, is one of Celtic’s main men and operates more like a winger than a full back at times. He takes up a much more advanced position than Mikael Lustig on the opposite side of the pitch. This leads to Lustig tucking in to form a back three with Ajer and Bitton, giving Celtic width in midfield. In the image below, the empty circle is where you would expect the left-back to be stationed in a back four. Ordinarily, you would expect Tierney to be level with Lustig (no. 23). However, Tierney is twenty yards advanced, in Astana’s half of the pitch. He is even ahead of the double pivot of Brown and Ntcham. It was from a similar situation that Celtic managed to equalise. Once again, Tierney is in an advanced position. We saw how comfortable Astana were, deploying a narrow block against Celtic attacks, but here Forrest is hugging the right touchline and Tierney is again providing the width on the left. This means Astana have a midfielder marking Tierney, leaving Celtic’s left midfielder, Scott Sinclair, in space. With Lustig in possession, Celtic have stretched Astana’s midfield, opening up vertical passing channels. The run of Ntcham here was also vital. The green square is Ntcham’s starting position – at the base of the midfield with Brown. 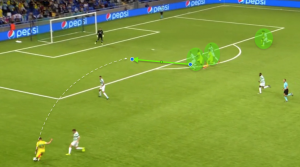 The circled Astana player thinks he is in position to screen the Celtic midfielder. But Ntcham surprises him with an intelligent run which also drags another Astana player with him. With two Astana midfielders consequently out of the game, and another two marking Forrest and Tierney in wide areas, Lustig finds McGregor in a dangerous pocket of space. He can then turn and play in Sinclair. The Englishman still had plenty to do, and produced an outstanding finish. But this was typical of Celtic stretching Astana then exploiting the spaces in behind. That goal left the hosts needing another six, and the tie was over bar the shouting. It had been the perfect first half from Rodgers’ men, who were comfortable and cruising towards the group stage. The Hoops began the second half on the front foot again, and had the first chance of the half through James Forrest. But, complacency was setting in. Tierney won an innocuous free-kick on the halfway line but rushed it back to Bitton who in turn went all the way back to Gordon. From a potentially forward looking set-piece position, Celtic were all of a sudden vulnerable to Astana’s high press which forced Brown into a mistake. Astana had their second goal, with the whole of the second half still to play. A third quickly followed when the outstanding Twumasi was left unmarked and able to pick his spot with a fine header from ten yards out. It highlighted another issue for Celtic. Midfielder Nir Bitton is a weak link when asked to fill in as a makeshift centre back. An alternative solution must be a priority for Rodgers, and indeed looks to have been found in the shape of Rivaldo Coetzee, who is on his way from Ajax Cape Town. Leaving three at the back allowed Astana an extra man in midfield. Celtic were unable to play out as they had in the first half and started resorting to long balls, giving possession back to Astana. In the first half, Celtic always had a pass out of defence to either Brown or Ntcham. McGregor had a free role and was found when Celtic transitioned from defence to attack. This outlet was gone now as you can see yellow Astana shirts bearing down on every Celtic player. Celtic were still in their 4-2-3-1, but Tierney being so advanced was now beginning to be a problem. This wasn’t lost on Rodgers who began to make changes. Rogic replaced McGregor, and Anthony Ralston came on for Forrest. With Ralston in Lustig’s position at right back, the Swede shuffled over to make a back three with Ajer and Bitton. Stuart Armstrong was on for Scott Sinclair shortly thereafter. This prompted a change of shape with Celtic going 5-4-1, and I would suggest Kieran Tierney had been invited by Celtic’s bench to stay at home in his left back position. In midfield, Rogic was at the tip of a midfield diamond to get up and support Griffiths. Brown remained at the base as the sole pivot, with Ntcham on the left and Armstrong on the right. From trying to stretch Astana in the first half, this was Celtic shutting up shop with five across the back and a narrow midfield diamond to choke the middle of the park. It worked, by and large, as long as Celtic stuck to that plan, as illustrated again below. One of the reasons that Kieran Tierney is Scottish football’s golden boy is his marauding runs up the left wing that get fans off their seats. However, he is only 20, and his inexperience showed slightly for Astana’s fourth goal. I am not criticising the youngster, nor would I try and curb his attacking instincts. However, he will learn that away from home in Europe, defending an aggregate lead; when the gaffer tells you to stay at home you should heed his advice. To be fair to Tierney, he put a magnificent ball on a plate for Leigh Griffiths, and had the striker scored, this would not be an issue for discussion. Tierney just couldn’t help himself though, and so he found himself once again Celtic’s most advanced player, as he crossed for Griffiths. Again, I’ll reiterate that had Griffiths buried the chance, as he would do nine times out of ten, Tierney would be the hero, once again being rightly lauded, with another zero added to his price tag. However, on this occasion, the normally deadly Griffiths lost his composure and blasted over. It was from the resultant goal kick that Astana flooded forward into the space that Tierney had left. Tierney (circled) is trying to get back, but his absence upfield has forced Bitton out to the ball. If Tierney hadn’t gone bombing forward, he would have been there to face up to Twuami, and Bitton would be covering behind him in the green square, where he should have been. Again, credit has to go to the forward, who was a handful all evening for Celtic. Craig Gordon would have been disappointed to be beaten at his near post as well, but it all came from Tierney (perhaps) ignoring instructions and bursting forward to attack. From then on, as Scott Brown said after the match, “it was a basketball match.” Astana had further chances to score, and leaving the inevitable spaces, Celtic were able to kill the tie off with two further strikes of their own. It was a breathless tie. A comfortable 8-4 aggregate win sees Celtic once again progress to face the cream of the continent’s clubs. But for a twenty-minute spell in the second half, it was a little more nervy than it needed to be!